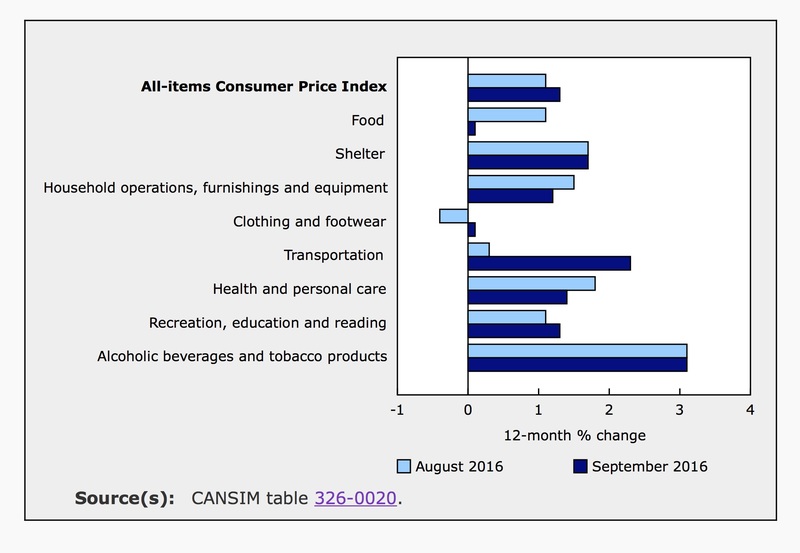 According to today’s inflation report from Statistics Canada, the consumer price index (CPI) climbed 1.3% over the year ending in September, up from 1.1% for the year ending in August. On a monthly basis, prices were up 0.1% in September, rebounding from declines of 0.2% in both July and August. Core inflation was 0.2% in September after remaining flat for three consecutive months. Markets had expected September’s numbers to be slightly higher; analysts surveyed by Bloomberg predicted 0.2% monthly and 1.4% annual inflation. Excluding gasoline, inflation slowed in September from August. The current CPI weights imply that gas accounts for roughly 3.8% of consumer spending. The CPI excluding gas was up 1.5% annually in September, compared to 1.7% in August. While the price of gas dropped 3.2% over the relevent 12-months, it rebounded 0.8% in the month of September. Positive growth in consumer prices in September was driven by higher costs for clothing and footwear. That index increased by 3.4%, including a 7.4% monthly spike in the price of womens’ footwear. The transportation index also ticked up 0.1% after falling 0.5% in August. Similarly, the index for recreation, education and reading gained 0.8% in September following a decline of 0.4% in the previous month. On the other hand, the price of food fell 1.3% over the month as the index for food at home was down 1.7% and the index for food at restaurants was up 0.1%. Also dragging down monthly inflation, the index for household operations and equipment declined for the third consecutive month, down 0.2% in September. After increasing for 11 months, the shelter index was flat in September. Every major components of the CPI was higher over the year ending in September. Higher shelter and transportation prices drove the annual inflation number while the highest rate of growth was in the price of alcoholic beverages and tobacco products. The transportation index increased 2.3% compared to 0.3% gain in August. This index includes gasoline, which fell -3.2% for the year ending in September, significantly less than the 11.5% annual decline in August. The index for passenger vehicles climbed 5.8% in September, further boosting the transportation index. The price of clothing and footwear inched up 0.1% over the year. Similarly food prices were up 0.1% in September, falling from 1.1% annual growth in August. This is the smallest annual increase in the cost of food since February 2000. At the grocery store, prices declined for the first time since March 2008. The index for food at home was down 0.9%, while the index food away from home reportedly climbed 2.5% year-over-year. Inflation accelerated in eight provinces in September compared to August. 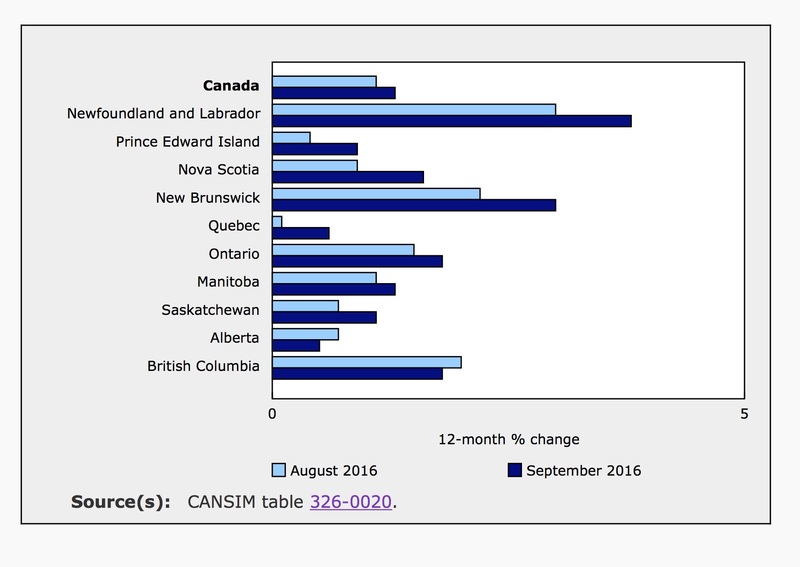 Inflation in Newfoundland and Labrador remains much higher than in the other provinces. 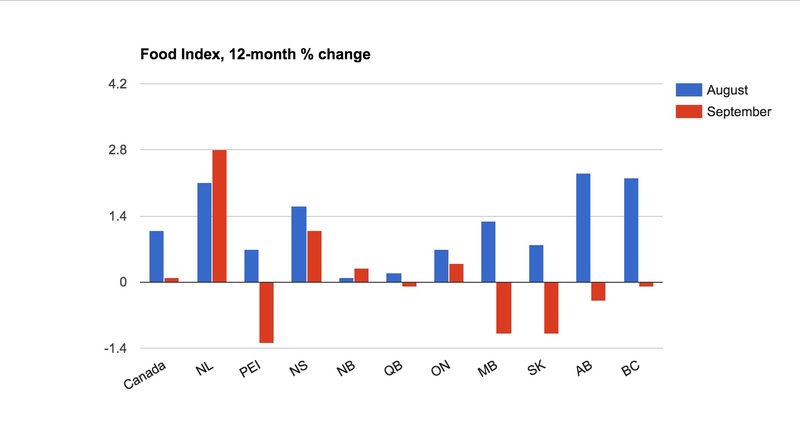 In this province, the price at the pump was up 18.3% year-over-year, well above the national average, a decline of 3.2%. 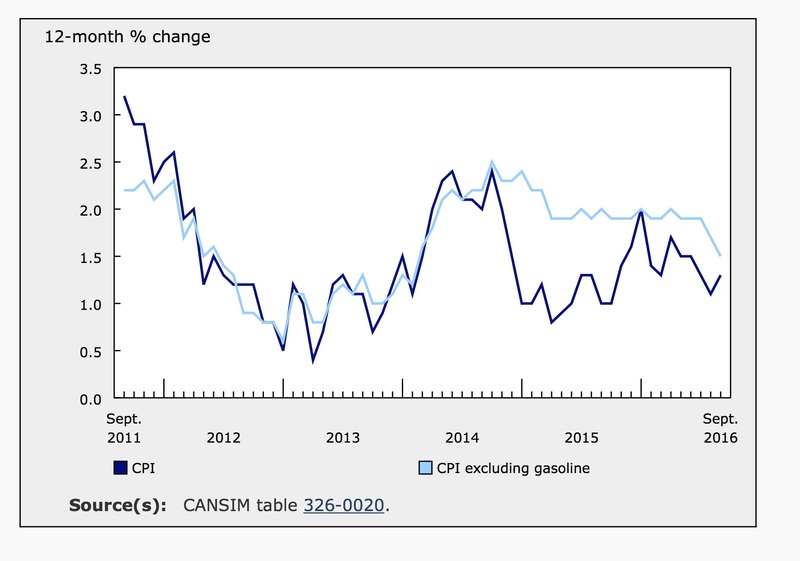 In Quebec, where inflation continues to lag, the price of gasoline fell 5.1% over the relevant year. 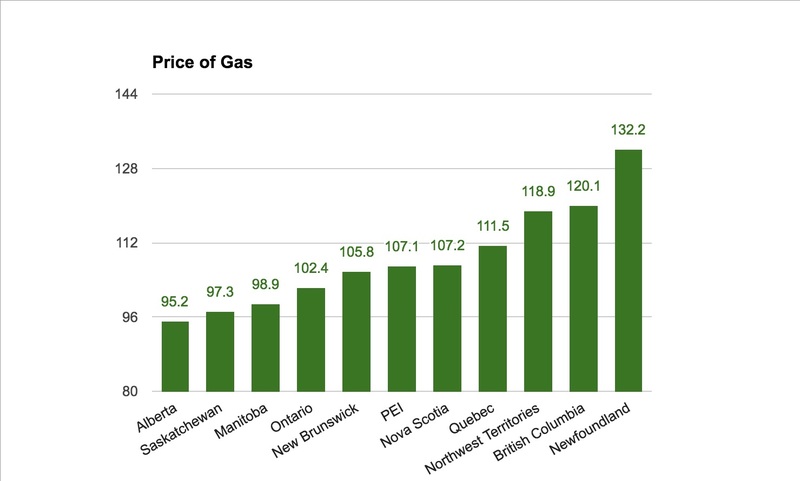 According to gasbuddy.com, the current price of gas in Newfoundland and Labrador is higher than anywhere else in the country. 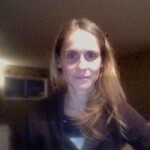 The inflation slowed in Alberta and British Columbia as a result of relatively larger declines in the price of food. The price of food in Quebec slipped 0.1% and shelter was up 1.0% in that province compared to 1.7% for all of Canada. The price of food fell in six provinces during the year ending in September after posting an annual increase in every province in August. This week, the Bank of Canada maintained its overnight target rate of 0.5% while also cutting forecasted growth for 2016 and postponing their expectations for a return to full economic capacity. The bank cites a slowdown in the housing market and struggling exports, despite the weak Loonie. Measures of core inflation remain close to 2% as the effects of past exchange rate depreciation and excess capacity continue to offset each other. Total CPI inflation is tracking slightly below expectations because of temporary weakness in prices for gasoline, food, and telecommunications. The Bank expects total CPI inflation to be close to 2% from early 2017 onwards, when these temporary factors will have dissipated, but downward pressure on inflation will continue while economic slack persists. Poloz mentions core inflation because it is thought to better reflect inflation that results from economic growth, whereas total inflation includes items with volatile prices, impacted by outside forces. Core inflation removes these items (fruit, fruit preparations and nuts; vegetables and vegetable preparations; mortgage interest cost; natural gas; fuel oil and other fuels; gasoline; inter-city transportation; and tobacco products and smokers’ supplies). At 1.8%, annual core inflation is close to the Bank’s target rate for total inflation. However, in recent months, core prices have remained stubbornly low. If this trend continues, the Bank may consider that a rate cut is on the horizon.